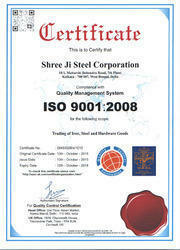 Shree Ji Steel Corporation is the leading manufacturer, trader, importer and exporter. We came into existence way back in the year 1978 as a Sole Proprietorship firm. We have our operational unit at Kolkata, West Bengal, (India). Our arrays of products that are most famous in the market are Iron & Steel and Hardware Goods. Our product range is in extreme demand in the industry due to its unmatched quality and durability. With our competent team, we are able to lay forth an international range of products. To meet the variegated demands of our esteemed customers, we are engaged in export with a number of international nations too. With our flexible payment gateways, prompt deliveries, sheer marketing practices, and customer driven approach, we have acquired a position of prominent market leader. We are committed towards our clients and make them pleased with our qualitative product range. We are regularly embarking new heights as we are immensely supported by a team of talented workers that not just aim to make money but to work with an art of creation. Our team works in unity which is basically required for driving the organization to eminent verticals. We are playing like a jock in the industry with the support of our workers. They take responsibilities and work hard to accomplish them in proper manner using their skills. Mr. Satish Kumar Gupta (Proprietor), of the company and under his shrewd governance we are augmenting at a rapid pace in the industry. He believes that a value-based culture in the organization is the true driver of any compliance program. We develop a quality plant environment that increases our business methods and productivity levels. In order to earn the rigorous requirements of our customers across the globe, we make sure to adhere to the highest manufacturing standards. Moreover, we push boundaries to adapt quality conformity in our connection with authorized vendors and third party manufacturers and administer precise quality checks to ensure worth of the Iron & Steel and Hardware Goods. Our sturdy and well integrated infrastructure provides the market reliability of our product range with developing technological innovation. Lying across a broad area, it features most advanced manufacturing improvements and abilities to meet the challenges of rising product demands. Our factory headquarters is fully furnished with high speed machinery and technologically excellent equipment that streamline the day to day actions of manufacturing, quality testing, stocking and distribution units. Our people are highly enthusiastic and assist as the greatest asset to the company. Our team aims to deliver unequaled performance by holding their field expertise and rich skills. Encouraging a collaborative work atmosphere our team of highly experienced R&D specialists, manufacturing specialists, engineers, technicians, sourcing agents, and warehouse managers truly understand that accomplishing the goals is a responsibility to be performed with a group. We have built alliances with the top most and allied vendors of the industry as a vendor come first in the supply chain. They provide us best quality material at very nominal prices. They work professionally and never create any kind of arguments. Being financially stable and credible to make bulk supplies, they have helped us immensely and stimulated our organizational growth. Our company is founded on the core values of development of industry leading assets. We are supported with the responsibility of operational perfection, which makes us liable to efficiently manage our resources. Further, we invested tremendous amount on supporting the prevailing manufacturing technology that promotes our consistent and thoughtful endeavors to become the ally of choice producing excellent quality within the accepted time frame.